Lavatera mallow, Lavatera trimestris or rose mallow is an annual plant in most growing areas and often mistaken for the hibiscus plant. The plant produces stem spikes up to a height of 4 feet with pink and white flowers that bloom in early fall. Collect seeds for propagation in the fall after flowering is complete or allow the plant to re-seed by letting seeds fall onto bare soil. Lavatera mallow is hardy to plant in USDA hardiness zones 3 through 10 and is best planted along fence lines and walls because of its height. 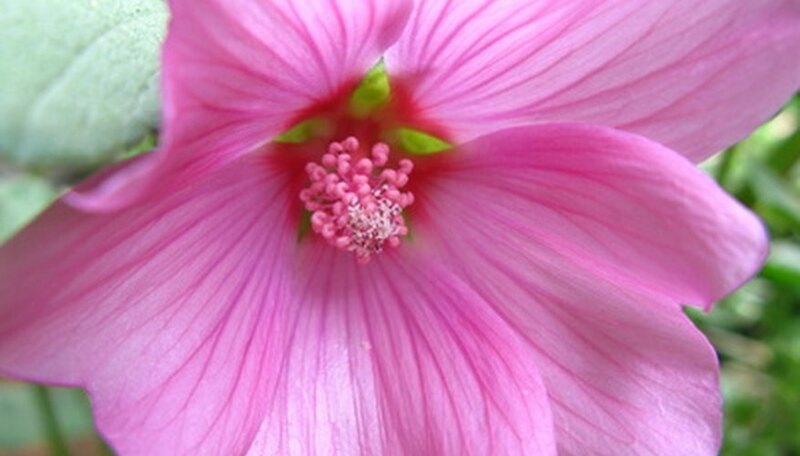 Plant the Lavatera mallow in a location that has a nutrient-rich, porous soil and full sunlight conditions. Seeds should be sown at a depth of 1/8 inch once the soil reaches 70 degrees Fahrenheit. Fertilize the plants every two weeks during the summer growing season with a quick-release, water-soluble fertilizer. Water the plants during the hot summer months when the rainfall amounts are less than 1 inch per week. Apply a generous soaking of water on a weekly basis to soak the soil several inches down. Place stakes around the plant and gently tie the stem to provide support as it grows in height. Prune damaged or dead branches to remove them from the plant. Remove frost-damaged branches by cutting them back to undamaged growth. Prune the previous year’s growth to a length of 10 inches from the base of the plant in early spring in areas where the plant did not die off in winter. This will promote new growth and create shape in the plant. Propagate the mallow plant by collecting seeds once the pods are mature. Lay the seeds on a flat surface to dry and store them in a paper envelope. Sow seeds directly into the ground in the spring at a depth of 1/8 inch.